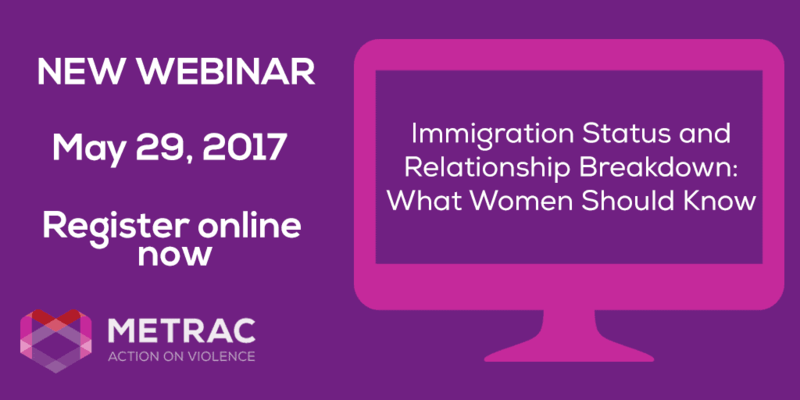 This webinar in the Family Law Education for Women (FLEW) series, in partnership with CLEO Legal Rights, discusses the different types of immigration status for non-citizen women in Canada and how status may be affected by their partner and the breakdown of their relationship. It explains the April 2017 changes in immigration law, specifically the removal of conditional permanent residence for sponsored spouses/partners and what this means for women who want to leave an abusive relationship. The webinar will also discuss legal options and tips for staying safe. METRAC’s Program Lawyer, Silmy Abdullah, will co-present with Immigration lawyer, Caitlin Maxwell of Equity Legal and the Barbra Schlifer Commemorative Clinic.